The Itty Bitty Kitty Committee: One Last Nap. One Big Match. One Last Nap. One Big Match. I hope everyone had a wonderful 4th of July. We stepped out for a bit for a BBQ but came home before the fireworks started to make sure everyone was OK. The Fellows didn't seem to notice the sound at all. The fireworks started at that time of the night when the kittens are at their craziest so they were too busy making their own noise to notice any booms. Wylla didn't seem to be affected, but Charlene took to a safe spot and hid until the fireworks were over, then she crawled into her usual corner of the bed and stayed there until morning. There were a couple of booms in the middle of the night, but thankfully our neighborhood was mostly quiet. I hope you and your animals all fared well. I'm thinking about my friends who work at the Humane Society today. On the 4th of July, so many frightened animals run off and get lost. The 5th of July is the busiest day of the year at the shelter, and the staff will be working so hard today to help reunite families with their pets. I hope that every lost critter finds their way back home. We took a day off from Fundraising for the holiday, but we're back today with a big matching donation challenge thanks to our Awesome Anonymous Donor. She'll be matching every dollar we give until we reach the $2500 cap. The match ends at 7:00 PM (Pacific Time) tonight. Hopefully, after having a day off, we're all rested up and raring to go! As I mentioned the other day, raising money for the specific programs and funds, like the Foster Program and Senior Cats, is important, of course, but the days in between count too. On these days our donations go to the general cat fund which helps cover the day-to-day needs of all the shelter cats. The general fund buys food, dishes, beds, blankets, litter boxes, kitty litter, toys, scratchers and all the essentials needed in every single cat and kitty cubby. It buys paper towels and disinfectants to keep the cubbies sanitary. It pays for vaccines, flea treatments, and the minor medical expenses for cats and kittens, too. All of these necessary items help keep the cats happier and healthier while they wait for their forever families to walk through that door. So, if you're in the position to give, please consider making a donation today! Every bit helps! It ALL makes a difference in the life of a shelter cat or kitten! Thank you so much! I'm so grateful for your generosity --and so is the Humane Society. And so are the cats! To make a tax-deductible donation and help us meet our $2500 match today, please pay a visit to our FUNdraising page. Thank you, Awesome Anonymous Donor, for offering up the fabulous match! And thank you in advance to all who help us meet it. As I mentioned on Monday, our babies have started leaving the nest. This photo below is of their very last nap together. I can tell by all of them comments on Facebook, Twitter, Instagram and the blog, you're all super sad to say goodbye -- we are too. 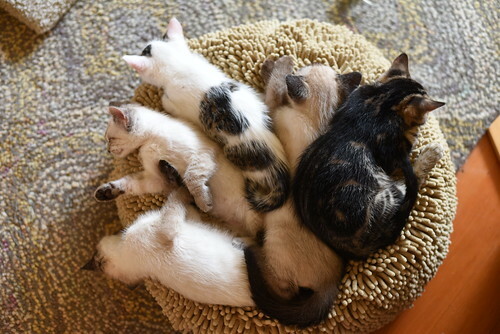 But boy, these kittens found some really incredible families and their futures are so bright! I'll be sharing the first adoption tale in a bit, so don't stray too far. This is just the most awesomely sweet photo EVER!! Just love how litters do this - so representative of how I wish the world would be. Aww... bye bye sweet babies. Happy life to you!! !